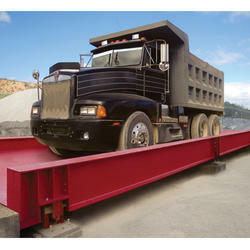 Our product range includes a wide range of truck scales, electronic truck scale and portable low profile weigh pad. Since our inception in 1996, we have marked a distinct position in the industry as a leading manufacturer, supplier and exporter of quality Truck Scales. These are mounted on the road or a concrete foundation and are used in weighing entire vehicle with its contents. After weighing the vehicle both empty and when loaded, load carried by the vehicle is calculated. Our scales are manufactured using superior grade materials at our state of the art machining facility. Moreover, our Truck Scales are available in various technical specification as per our clients' requirements and at pocket friendly prices. "Our innovative weighing systems offer greater reliability, higher strength and faster installation than conventional systems. They have fast bolt-down sitting along with innovative box structure that made them perfect for the weighing applications." With in excess of 4000 establishments the nation over we can give master guidance on the ideal kind of weighbridge to suit your site conditions and meet your operational objectives. Customized FLEXI Mobile weighbridge are also offered; this provides you a flexibility to select your weighbridge based on the vehicles, your industry and other requirements. Our company is fully adherent to quality and client's satisfaction and thus, known to be the trusted manufacturer and exporter of the Electronic Truck Scales. Widely used to weigh the total load on the truck, these scales are highly acclaimed in the market. Manufactured from high grade metals, the entire range of truck scales is in confirmation with the industrial standards and norms. Offered in different capacities starting from 5t to 200t and platform sizes of 3m X 3m to 21m x 5m, this Electronic Truck Scale is available at the market leading prices. We are engaged in offering our clients a wide assortment of Portable Low Profile Weigh Pad. In order to manufacture these pads, we make use of high grade raw material and cutting-edge technology. 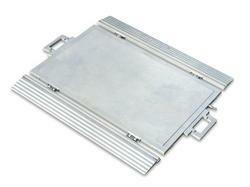 These are designed with high precision in order to meet the set industry norms. Our offered Portable Low Profile Weigh Pad are highly appreciated among clients due to their robust construction, high durability and less maintenance. These are available in various specifications as per the varied requirements of clients. Machine is in lightweight high strength of aluminum. 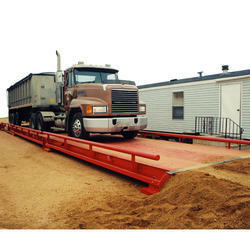 Looking for Truck Weighbridge ?